I have become a little obsessed with citrus - every sort of citrus fruit seems to occupy my mind these days. And of course, the cosmos conspires to provide me with plenty of variety! Not only have I had top quality sweet limes or mosambis as we call them, from Luv Thy Farmer, which I used to make this amazing Mosambi Cake, I got Meyer lemons from Imtiaz and Sue which I used in these beautiful Lemon Cakes, and then Rushina gave me a couple of Pahadi Limbus that she'd got from her in laws' village in Garhwal! My cup of happiness was overflowing. Did I mention I have been haunting gourmet stores, making a beeline for their fresh veg sections and getting busy scratching and sniffing the lemons looking for the fresh and flavourful ones?! Anyway, coming back to the pahadi limbus. They are huge. Bigger than your average apple, in fact. The skin is thin and must be zested carefully. But what a burst of freshness when you give it that light scrape against the microplane! 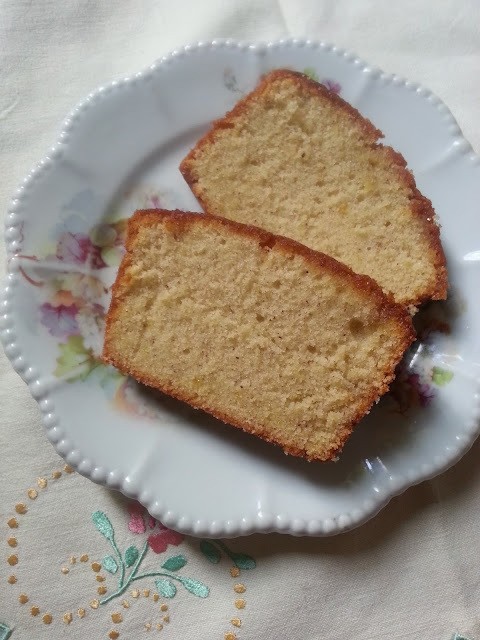 The limbus waited patiently for me to find a recipe worthy of them and I chanced upon this Hot Buttered Rum Pound Cake recipe. The recipe uses oranges but I thought the pahadi limbus would shine here, and oh they did! A look in the drinks cabinet for something instead of rum, a hunt through the pantry cupboard for the rest of the ingredients, and I was set. The recipe has three elements - the pound cake, the soaking syrup, and the hot buttered brandy. I'm going to give you the recipes in the order they are made so you're not going back and forth between ingredient lists and the methods, thereby giving you less room for error and confusion. Though I have largely followed the recipe above, I have made a few adjustments and replacements to make it more suited to what the hubby likes. Mix the zest into the sugar with your fingers and help them release their oils. This gives more flavour. In a small pan heat the sugar-zest mix with the brandy and a little water. Bring it to a boil stirring gently till all the sugar is dissolved. Boil the mix on a medium flame for another minute and then leave it to cool as you make the cake. Set the oven to preheat at 180C. In a clean mixing bowl combine the flour, salt, cinnamon powder, and the crushed cardamom seeds with a whisk. 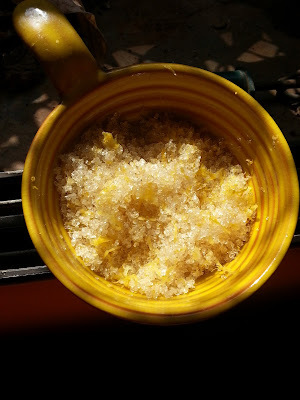 In a small bowl mix the zest into the granulated sugar till it starts getting clumpy. This step helps release the oils from the zest and extracts maximum flavour from it. In the bowl of your stand mixer, or in a regular mixing bowl beat the butter on medium speed till it is light and fluffy. 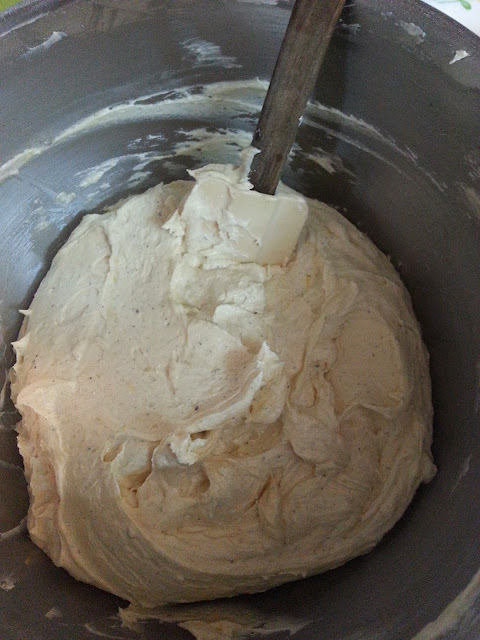 Add the sugar-zest mix to the butter and beat for a few minutes till it's all mixed and light. Beat at a high speed for a few minutes. Make sure you stop the beater and scrape the sides of the bowl and the paddle to mix everything properly at least once. Now it's time to add the eggs. Add one egg at a time and beat well to mix completely before you add the next one. Once all the eggs are added in pour in the vanilla extract. The original recipe has zest and a flavour extract - I opted not to use the flavour extract because I was sure it would mask the flavour from the zest completely. I'm glad I did because the cake was full of natural lemony flavour and didn't need any help at all. Once the eggs and vanilla have been fully incorporated add the flour mix next. I do this a little at time with the help of my 1/4 or 1/3 cup measuring cup, whichever is clean and at hand. Keep adding a scoop of flour and continue beating till you have a smooth batter. This cake has a thick batter beautifully speckled with the crushed cardamom seeds and cinnamon powder. Pop into the preheated oven and bake for roughly an hour at 180C, till the cake is a nice golden colour. It should ideally split along the middle too. If your cake is browning too fast reduce the temperature to 160C and bake it longer till it is cooked through. Test with a skewer to check for done-ness. 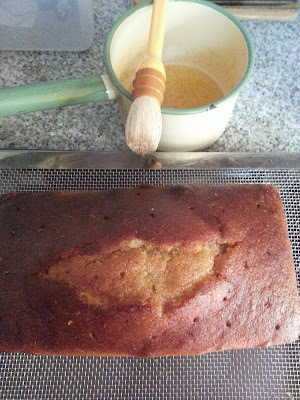 Leave the cake to cool in the tin for around 10 mins or so and only then remove to a wire rack to cool further. Place a tray under the rack to catch any drips, poke the surface of the cake with a thin skewer and then brush it with the brandy syrup you have left to cool. Be generous and keep slathering the cake - it will absorb a lot of that syrup. Do this while the cake is still quite warm. Let it cool on the wire rack. Heat the butter in a small pan till it begins to foam and turns brown. It will start to smell nutty. Stir with a wooden spoon or heat proof spatula to brown the butter evenly. Take off the heat and let it cool for a minute. Now add the sugar (preferably brown) and then the brandy. Stir nicely to combine. Use a fine grain sugar for a smoother glaze. Spread the glaze on top of the cake with a pastry brush. Slice and serve your Pahadi Limbu infused Hot Buttered Brandy Pound Cake immediately. Keep any leftover glaze in a covered jar and warm it slightly to serve with any remaining cake. This is another beautifully flavoured tea cake that has the freshness of lemon and cardamom along with the warmth of cinnamon. Since the pahadi limbu is difficult to get, you can use regular oranges as in the original recipe. The cake has many sugary elements and therefore I have cut down the sugar slightly in the cake. You can adjust the sugar according to your preferences. 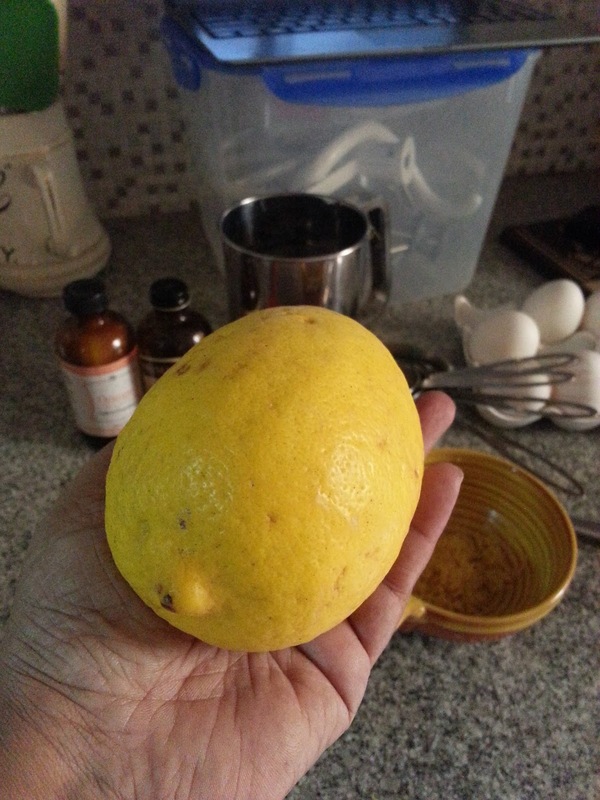 Meyer lemons would also work very well in this recipe as would mosambis or sweet limes. Use more zest if you're using mosambis as they tend to be quite mild in flavour.